Future ACES has been created for 10 to 14 year olds and is the first rung on the ACES Ladder consisting of Future ACES, Junior ACES and Elite ACES Programmes, forming the structured Pathway from beginner Junior to Elite Golfer. Sportsmen and Women are getting better and better, younger and younger, making it even more essential to provide our youngest golfers with the same care, attention and structure of pathway as our older students, providing the opportunity to be successful as a young Student-Athlete. Future ACES Student-Athletes are educated not only in the skills required to better and enjoy themselves on the golf course, but also learning important physical literacy and co-ordination skills that will benefit them in all life activities, developing Athletes First, Golfers Second. Golf also is an amazing sport for learning important life skills including Hard Work, Drive, Passion, Progression, Organisation, Emotional Control, Etiquette and an infinite amount more, with a huge passion of ours being to develop not only a great athletes, but great people. Future ACES Student-Athletes attend Sotogrande International School (SIS) for their daily education from 9am to 4pm, studying the IB Primary Years Programme (PYP) and progressing to the Middle Years Programmes (MYP). 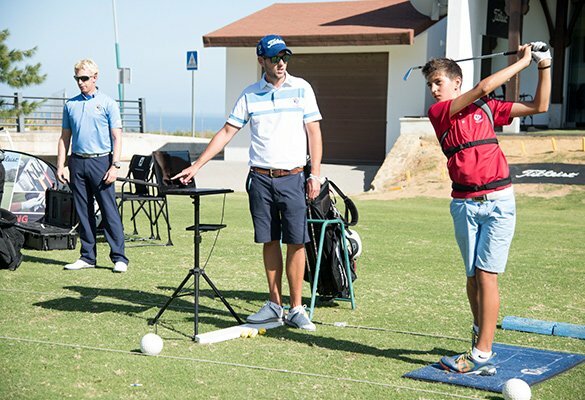 After school they attend the Jason Floyd Golf Academy (JFGA) from 4:30pm-7:30pm, where, like all the ACES Programmes, they receive a personalised programme in Technical, Physical and Mental performance aimed at their age and ability, for a number of days per week of their choice.